Go to the end of this post for Valentine’s Day ideas. This is the more interesting of the two stories today about healing lepers. It is also unfamiliar for most children and adults. This makes it a good day to pull out all the stops on storytelling. There is a lot of action in these 15 verses. (I, and several commentators I read, would add the first part of verse 15 to this reading.) To help worshipers follow action, have it pantomimed as it is read. A youth class could do the job. But it would be more interesting to use of players of the appropriate ages. Players might wear jeans and dark shirts. Most characters have one defining prop. This could simply be the scripture reading for the day. Or, you could ask the characters to stay in place on stage and move into the sermon by moving among the character, commenting on their actions. With prepared players, you could even have conversation with the characters about what they did and how it felt. Whichever you do, some rehearsal is required. Reader/Stage Manager: Our story today is only fifteen verses long but involves eight characters, two kingdoms, and one river. First, of course, the kings: There is the king of Syria. Beckon deferentially for the King of Syria in his crown to take his place. And there is the King of Israel – a much smaller country and so a less important king, but still a king. Beckon deferentially for the King of Israel in his crown to take his place, possibly on a lower step from the king of Syria. And there is Naaman the general of the army of the King of Syria – another very important man. Grandly direct Naaman to a spot near the King of Syria. Naaman has a wife - I forget her name. And the wife has a young servant girl - who cares what her name was. Point dismissively to their spots. Naaman also has a servant, sort of his right hand man. Point to a spot by Naaman for his servant. That is the cast in Syria. Over here in Israel, there is also a prophet named Elisha. The prophet also has a servant. Point to spots for Elisha and his servant. There are several large, beautiful rivers in Syria, but for our story the important river is the muddy little Jordan River in Israel. Spread out the muddy river and show the river shakers where to stand or describe the muddy Jordan River pointing to where it is to be imagined. Oh, our story involves a disease, a dreaded disease, called leprosy. It was and is a horrible disease. Its symptoms are sores that do not heal and spread. Eventually toes, fingers and even whole limbs fall off. In the time at which our story takes place, people were so frightened of the disease that victims were sent away from their homes and communities. They lived together in caves. Some of their families or kind folk from town left food and clothes for them near the caves, but they never got very close. When no food appeared the lepers had to call out to travelers begging for what they needed. Today we have drugs to treat leprosy. But, in the days of our story there were no cures. Shiver and shake your head as you conclude this description. Now, we are ready for our story. It begins with Naaman at home in Syria. Naaman, the commander of the Syrian army, was highly respected and esteemed by the king of Syria, because through Naaman the Lord had given victory to the Syrian forces. Naaman stands tall and folds his arms across his chest. He was a great soldier, but he suffered from a dreaded skin disease. Naaman inspects the back of his hand and hides it behind himself. In one of their raids against Israel, the Syrians had carried off a little Israelite girl, who became a servant of Naaman’s wife. Servant girl pretends to brush mistresses hair. Servant girl pantomimes speaking. Mistress turns to listen, then turns toward Naaman and reaches out to him. Naaman turns toward the king of Syria. The king gives him a letter (rolled up piece of paper). Naaman bows to the king, picks up a large burlap sack or black garbage bag stuffed to look heavy and full, hands the sack to his servant who hauls it as if it were heavy. Naaman keeps the letter. He then goes to the king of Israel. Naaman bows before the king of Israel and hands him the letter. The king opens it, reads it, and puts his hands over his face or makes other signs of despair. Elisha puts his hand to his ear as if listening, then sends his servant to the king. The servant bows to the king who sits/stands up and looks relieved. As the servant backs up to take his place beside Elisha, the king looks at Naaman and points toward Elisha. So Naaman went with his horses and chariot, and stopped at the entrance to Elisha’s house. Naaman and his servant go to Elisha. The servant pretends to knock on the door. Elisha sent a servant out to tell him to go and wash himself seven times in the River Jordan, and he would be completely cured of his disease. Elisha’s servant standing in front of Elisha, pretends to open the door and points toward the river, then closes the door. Naaman stamps his feet, scowls, and puts his hands on his hips. Naaman’s servant, cautiously taps Naaman on the shoulder, pretends to speak reasoning with his master using his hands to suggest the possibility of trying the river. Naaman listens, shrugs his shoulders, and turns toward the river. 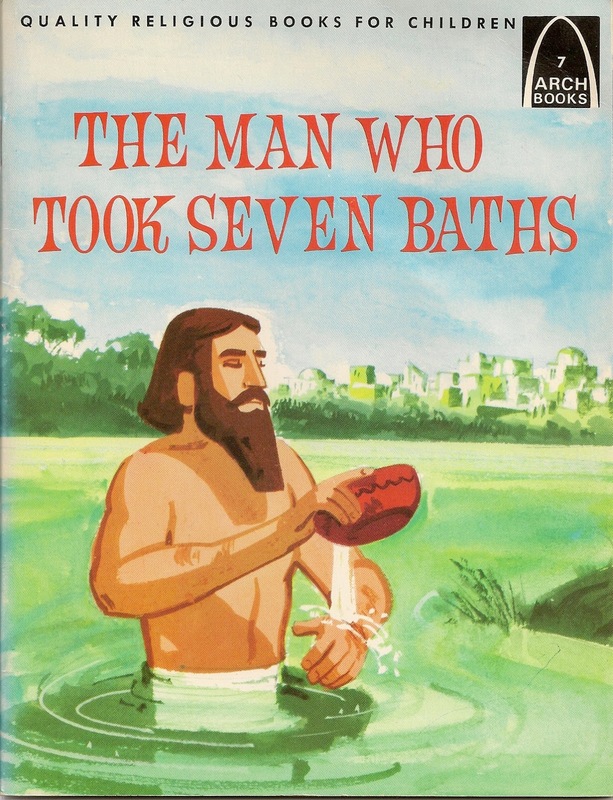 So Naaman went down to the Jordan, dipped himself in it seven times, as Elisha had instructed, and he was completely cured. His flesh became firm and healthy, like that of a child. He returned to Elisha with all his men and said, “Now I know that there is no god but the God of Israel…”. Naaman and his servant return to Elisha’s door. The servant knocks again. Elisha pretends to open the door this time. Naaman and his servant bow before Elisha. God works through the powerless is the key idea of this story for children. Children, who often feel powerless and sense their ideas are ignored, are delighted that a little girl is the heroine. She speaks up and is listened to. Naaman actually takes her idea to the king, who produces a letter of introduction to a second king, then travels to find the prophet she mentions. Naaman’s powerless servant is the other hero who speaks up to convince his master that he ought to try following the prophet’s instructions. All the “powerful” people in the story (General Naaman and the two kings) save the day by submitting to the advice of the “powerless.” That preaches on many levels. It assures children that God works through them now (not when they grow up) and encourages them to speak up and act boldly based on what they know about what God wants and does. 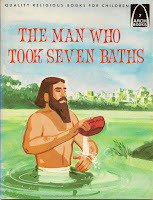 The Man Who Took Seven Baths, by Joan Scheck (Archbook) is hard to buy today, but might be available in the church’s library for children. It tells the story in simple straight language. Omit the last lines on the last page about Naaman’s gift. For children this is mainly a psalm that Naaman and the healed leper in Mark might have sung. To help them see that point to verses 11-12 before reading the psalm. Imagine the healed lepers feelings. (If a child raises the question of those who are not healed, note that there are 150 psalms. This one is for those who are healed. There are other psalms for those who are not.) Then read the psalm. This psalm is filled with unfamiliar words (Sheol, the Pit, sackcloth, etc.) and word images that do make immediate sense to literal thinkers. The Good News Bible provides clearer language, but loses the beauty of the poetry in the NRSV. Either choose the NRSV knowing the children will miss most of it, pick out a key verse or two in NRSV to unpack for the children, or use the TEV. 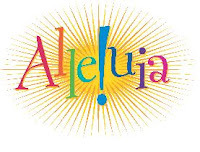 If you “bury the alleluia for Lent,” this Sunday (and Transfiguration Sunday next week) are good opportunities to savor the word and use it frequently in worship. Display “Alleluia!” banners. Sing songs with lots of Alleluias! Alleluia! is a word we use to express the joy described in Psalm 30. Reread verse 5 explaining that even when things are going very badly, we know that the bad stuff is not the final word. Alleluia! is. Point out to the children that there is a difference in happiness and joy. Happy and Joy are what we feel when everything is going great. Happiness disappears when things start going badly (someone is sick, scary things are happening, things we want to happen don’t happen). But, because we know God is with us even in the bad times, we still can have joy. A monk named David Steindl-Rast says that joy is “that kind of happiness that doesn’t depend on what happens.” That is a challenging, but useful idea to children who are only beginning to learn that their feelings at any given moment don’t have to run their lives. I’ve got the peace that passes understanding…. I think this passage comes a week or two early for children. One way children understand and practice Lent is as Spring Training for Christians. It is a time to practice our Christian living skills so that we can become better disciples all year long. So, I’d tend to save this passage for introducing Lent and the Lenten practices to which you are calling them this year. We are a bit between the seasons in sports in North America. The Super Bowl is a memory. The big basketball tournament is still ahead. And, the Summer Olympics in London in July is barely on the radar. So, it’s a good time to talk about athletes in training getting in shape and honing their skills. They work hard every day to be prepared for events that are months away. Adults appreciate this. Children are less enthusiastic. They have to be urged to practice during the off season, preferring to play games and dream of making “the big play” without practicing the skills that will make that play possible. Warning: Because children think literally they can conclude from this that we are in some sort of game with God and only those who play well can win God’s favor. Be specific about the Christian living skills we practice (Bible study, prayer, etc.) and how we use them not to gain God’s favor but to play on God’s team. As a healing story, the 2 Kings account of Naaman with all its rich detail offers more to both children and adults. Mark’s story reverses the usual lectionary pattern and is really the companion story to the Old Testament story. Some children are puzzled by the leper’s disobedience. After healing him, Jesus clearly instructs him to tell no one. The leper, however, tells everyone who will listen. Preachers often speak at length about knowing something so wonderful that you cannot keep it to yourself. Adults understand that and forgive the leper easily. But for children obedience is more important than it is to most adults. So, before you praise the leper for disobeying Jesus, figure out what you will say to the children about it – and share what you do with the rest of it in comments! Tuesday is Valentine’s Day. That is a big deal among children. They are making valentines for their family and friends and looking forward to parties. I don’t find any easy connections to today’s texts. If you do, please share in the Comments! One way to note Valentine’s Day in worship is to introduce worship as a valentine we share with God. In our songs, prayers, and readings we tell God of our love and we hear how much God loves us. Call the children to the front before the Call to Worship to point this out and give them each a small sheet of heart stickers with which to decorate their printed orders of worship. Older children can place a heart sticker by each song or prayer that speaks of this love. Younger children will simply decorate the page with them. As they leave the sanctuary after worship look at their bulletins and comment briefly. Instead of giving out stickers, give each child a small bag with a few large paper hearts and some markers with which they can make valentines for God during worship. They can put their valentines in the offering plates as they are passed or be invited to tape them to a rail or table up front at some point during the service. Valentine’s Day is also a good opportunity to remind children of Jesus’ two big rules: love God and love each other. Give children (or all worshipers) a small red paper heart to put in their shoe as a reminder of both of these loves. Or, give them one heart printed “love God” to put in one shoe and another printed “love each other” to put in the other shoe. 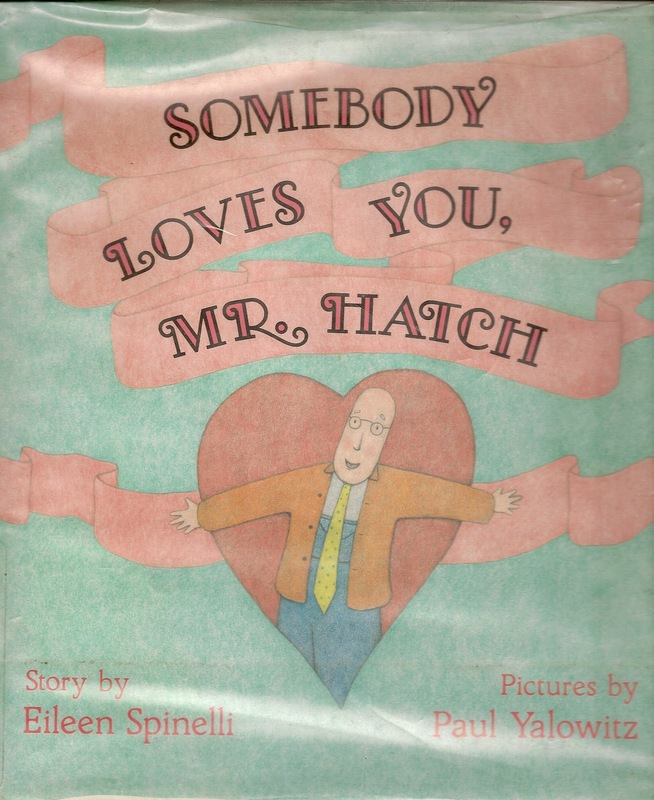 One of my favorite books for Valentine’s day is Somebody Loves You, Mr. Hatch, by Eileen Spinelli. 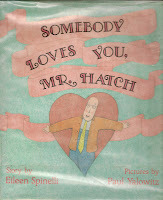 Mr. Hatch lives a dull colorless life until a giant box of chocolates is delivered. In response he reaches out to people around him loving and being loved by them. When it turns out that the candy was mis-delivered, his neighbors convince him that lots of people do indeed love him. It takes almost 15 minutes to read aloud and would not be easy to condense or read in part. So, it would have to be a significant part of a sermon. If you have a favorite book that could be read in less than 5 minutes in worship on Valentine’s Day, how about telling us about it in Comments. The connection I see between the gospel story and Valentines Day is as an example of showing God's love to those who we may see as outsiders. Yes, that's EXACTLY where I'm going! Most of "my" kids are 3-6 years old ... they're making Valentine's cards for the people in the nursing home where we'll lead a service later in the afternoon, people who appear "scary" to the littlest ones at this point in their journeys. Do check out http://kidzandmore.wordpress.com/ (see comment above). The way she develops the disobedience of the leper could be a children's moment or could become a major theme in the "real" sermon. My sermon title is "Healing Presence." I'll be discussing choices in the face of opportunity, and whether we will take the challenge to choose to be a healing presence as Jesus did. My children's time today will connect making Valentines for those who are "shut off from the community" by virtue of illness or inability to get there, as a means of being a healing presence. There will be a challenge to take it a step further, and deliver the valentines in person rather than just sending them through the mail as a means to also responding to the opportunity to build/restore relationship. Julie, the way your children's moment fits into the service is wonderful! One idea (even though at 9:10 Sunday morning this is a moot point- I'm home with a "you don't want your children near me" cold): Could you provide the materials for making valentines during worship, esp. during the "real" sermon rather than encouraging them to make them at home? A zip-lock bag with one or two folded pieces of white paper and even one red marking pen is all they need. They can use a hymnal as a desk in their laps. Encourage them to deliver the cards or put them in the offering plate for the deacons (or whoever visits in your congregation) to deliver.